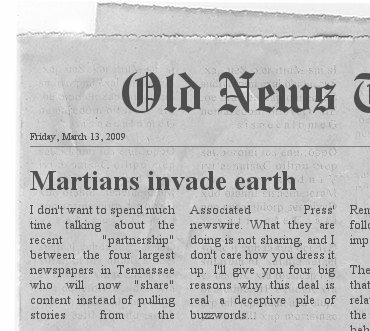 OK, so the big four in Tennessee have decided to share content. Wonderful, but why is this necessary? For the print editions, this actually does make quite a bit of sense. You are swapping the stale national news and a few tidbits of local (that no one who owns either a Television or computer really bothers to read) with richer state oriented news from other areas of Tennessee. The AP costs lots of money and I’m assuming the “partnership” would lessen those fees significantly. Content sharing for the Web publications makes absolutely no sense at all. In fact its completely contrary to how the Internet behaves. Now if you had people who understood how the web functioned in the first place then you might be able to maneuver around these hurdles and factor that into the partnership. Reproduced content on four different web sites means absolutely nothing to me what-so-ever. It’s exactly what was wrong with regurgitating the AP wire stories. Instead of “sharing” content that you will very obviously attribute to the other news organizations, why not give a quick introduction tailored to your audiences understanding and then link to the original content (the deal limits content sharing to some asinine guideline of two lines plus the headline). See, that’s what real web sites do. (The exception being large publications that dwarf smaller publications who may have broken good news. Definitely not the case here). Big media should already be link sharing good content and they shouldn’t need a partnership agreement to do so. It also shouldn’t be limited to just the big four. If a story merited coverage that was a bit strenuous and off the beaten path, newspapers would buckle down and produce an original piece of journalism worth of their own publication’s slogan. Four big newspapers meant that there could be four completely original pieces of journalism that would fill in the cracks when examined together. This will now be divided by four, and as newspapers cope with finances in “today’s economy,” overworked editors will opt to spread their coverage elsewhere, since one paper is already doing a report on a particular topic. Instead of four good articles, you’ll eventually end up with just one. The “partnership” will also enact the subtract by three equation, in which there are eternally three less pairs of eyes looking at bad reporting so that they can determine that it’s indeed bad reporting. Sometimes it’s tough to catch the big errors. I’ve made plenty of them and I’m glad to have had others giving it a second, third and fourth look. By enacting their own Tennessee newswire service, all four of the big newspapers walk a very thin line between acting like one giant media company with four separate bureaus. Of course, this isn’t actually the way they see the “partnership” and each paper still retains their editorial independence. They will try to accommodate each other and as a result all of them will become weaker. This is perhaps the most important reason why the partnership between these newspapers is not what it appears to be. They did not decide to share content in the name of good journalism or to improve the quality of information being reported. The partnership was forged entirely because of financial reasons. They eliminate the fees paid out to the Associated Press and replace it with what they would assume is a superior localized wire at a much cheaper cost. At the same time, they support each other rather than outside entities and the all benefit. Maybe that will work, maybe it won’t (probably it won’t), but don’t walk around professing that the newspapers finally figured out how to share. No one is qualified to make that judgment at such an early stage in the media’s news era.